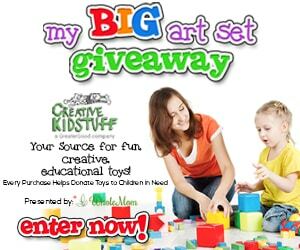 Have you heard about the free giveaways from Creative Kidstuff website? Creative Kidstuff is the absolute source for fun, creative, and educational toys. The winner will receive a bundle of awesome Kidstuff products valued over $200! This bundle includes a Li’l Davinci Art Cabinet 12 x 18, Tots Finger Paints, Finger Paint Paper, Li’l Davinci Art Cabinet 9 x 12, Sketch Pad, Colossal Art Set, My Giant Busy Box and Do A Dot Art. You must enter fast. This Whole Mom sponsored contest ends on February 12th.